Vladimir Putin has made much of the fact that Russia declared that there are to be three “state languages” in occupied Crimea – Russian, Ukrainian and Crimean Tatar – but only the study of Russian will be obligatory, an indication of how the Kremlin intends to destroy other languages not only in this annexed territory of Ukraine, but also in the Russian Federation itself. That is the upshot of discussions in the Crimean parliament this week. That body’s vice speaker, Remzi Ilyasov, himself a Crimean Tatar, proposed that students be required to study one of the languages on an obligatory basis, but according to media reports, no one supported his proposal. Instead, they said Russian must be obligatory because Crimea is in their view “a subject of the federation” and that the study of any other languages, including the two “state languages,” could take place “exclusively on a voluntary basis.” That means those who want to study Ukrainian or Crimean Tatar must also study Russian and can choose to study the others only by giving up one or another subject, something few parents are likely to do. Not only does this show the real direction of Putin’s language policies (see here), but it represents a challenge to all non-Russian republics within the Russian Federation, most of whom require some of their pupils to study the republic language. That is something that many Russian nationalists very much oppose, and now that there is what Turkist.org calls “the Crimean precedent,” these nationalists are going to feel entitled to demand an end to the existing practice and insist that Russian be the only required language regardless of the Russian and non-Russian constitutions and laws. If such demands are met, the future of many of the non-Russian languages will be put at risk. 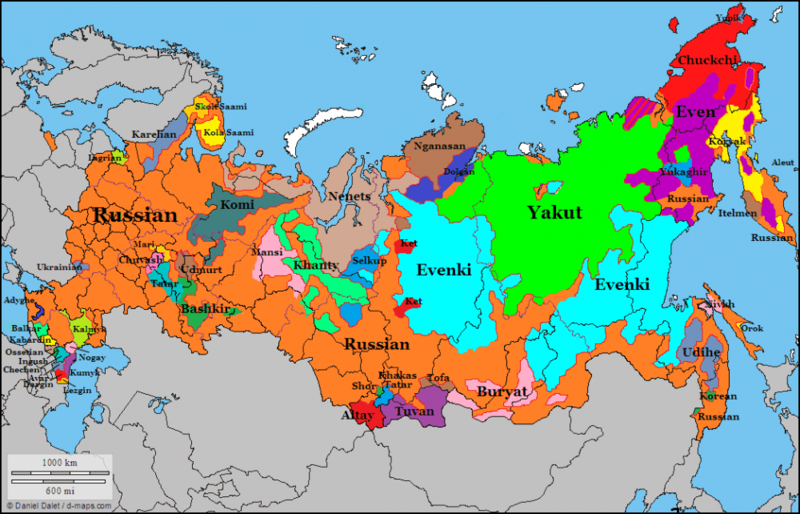 As Turkist.org points out, among the languages in the Russian Federation that UNESCO has declared to be “at risk” are Bashkir, Chuvash and Yakut, all of which are being kept alive by official support in the schools.